Staffing Firm Reaches Out to Hire U.S. Veterans Now! 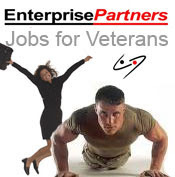 EnterprisePartners, LLC, an experienced and trusted staffing augmentation firm, is partnering with HireVeterans.com to offer US Military Veterans employment opportunities. The combination of dedication, commitment to excellence and “real world” problem solving are all attributes highly sought after by employers and coveted by the staffing consultants at EnterprisePartners, LLC. They know that US Veterans are some of the most skilled and experienced individuals in the world who have the ability to “think on their feet” while working under pressure.Many staff augmentation firms promise experienced consultants – but will your critical project be the training site. “Recruiters” are often familiar with the alphabet soup of technology (SAP, ERP…), but do they really understand your requirements. Founded by successful independent consultants, EnterprisePartners brings over 25 years of real IT experience to bear when staffing your project. Over 90% of our consultants come from professional referrals, and all of our consultants are screened internally (so you don’t have to). SAP customization and implementation to include all aspects of: Data Conversions and Migrations, Interface Development, Customizations, and BASIS configuration and management. ← Exciting New Fire Safety Company hiring Veterans! Veterans Today Network is a fully independent media network providing news, information, and media for U.S. Military Veterans since 2003.